Fibox’s HMI cover kits protect instruments or electronics components that need secure accessibility. The Instrument Protection Window (IPW) permits both viewing and access to readouts and controls which are surface mounted on any metal or non-metallic enclosures. These HMI covers allow for easy viewing of meters or displays and afford direct access to HMI controls on any underlying enclosure. 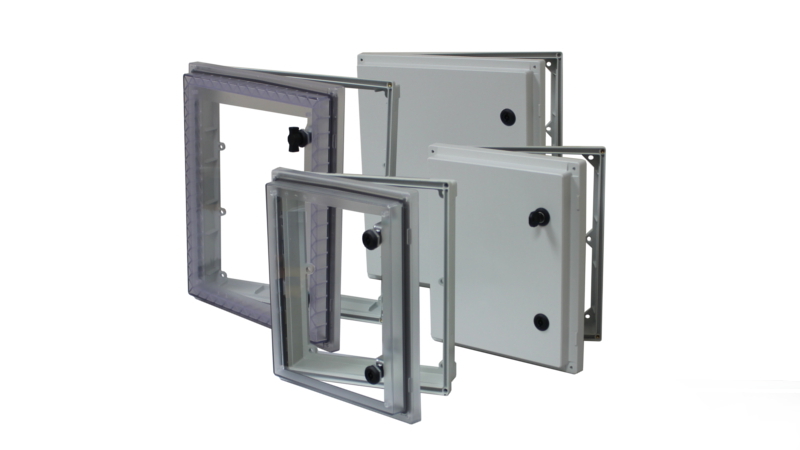 With a working depth of over 3 inches, Fibox’s IPW provides an easy to install, secure HMI access cover on any enclosure while still retaining it’s NEMA 4X enclosure rating. Indoor or outdoor, the IPW maintains a water and dust free environment with a dual formed in place polyurethane gasketing system and low profile continuous hinge design. With several secure locking options, The IPW ensures safe access to hazardous parts or equipment inside the enclosure and a higher degree of protection to personnel. With two sizes available (12 x 10 3.31 and 16 x 14 x 3.31), the IPW is made to the same exacting standards of all Fibox enclosures and is UL listed and rated NEMA 4X. Rugged, UV protected, impact resistant polycarbonate makes the IPW a robust solution for all cabinets and control panels. Contact Fibox to learn more.